How is Reynaud’s usually treated? How has Circu-Live helped others? Reynaud's disease is a condition of the circulation that affects blood supply to the skin and causes the extremities of the body to lose feeling and become numb. The symptoms of Reynaud’s are most commonly associated with cold and stress and sufferers of this condition will find their toes and fingers feel very cold or even lose sensation in response to a stressful situation or exposure to cold. People with Reynaud’s disease may also notice their skin changing color to pale and then to blue when they are cold or stressed - particularly the fingers. They may feel a prickly numbness when cold or stressed and sometimes a stinging pain with throbbing and redness when they begin to relax or warm up as blood returns to the extremities. Though not completely understood, Reynaud’s seems to be caused by an overreaction of blood vessels in the extremities to temperature and stress. In normal physiology, when a person’s body is exposed to cold the blood vessels in the extremities become narrowed and slow down blood supply to the fingers and toes. This is to prevent excessive heat loss from these areas and preserve the body’s core temperature. Similarly, in times of stress the evolutionary “flight or fight” response is triggered and blood flow to the fingers and toes is reduced as the body tries to conserve blood for the vital organs and muscles. In people with Reynaud’s these responses are exaggerated - causing troublesome symptoms. The reduced blood flow leaves the extremities looking pale or even blue and cold as no warm blood reaches these areas. Some people have Reynaud's as a complication of an underlying disorder (Secondary Reynaud’s) though more commonly this disease appears independently and on its own and is known as Primary Reynaud’s. In Primary Reynaud’s the cause of the condition remains unknown. Conditions that may cause secondary Reynaud’s include Scleroderma, a condition that causes hardening of connective tissue, Lupus, Rheumatoid Arthritis, Carpal Tunnel Syndrome and other diseases that affect the arteries including atherosclerosis. Smoking, beta blockers, certain Chemotherapy agents and some OTC cold and flu medications can also predispose an individual to Reynaud’s. Certain factors may also increase an individual’s risk of having Primary Reynaud’s. Women are generally more commonly affected as are people who live in cold places and those who suffer from chronic stress. Complications of Reynaud’s are fairly rare and the day-to-day discomfort and inconvenience is the most common complaint amongst sufferers of this condition. In severe cases though, blood supply to the fingers and toes could diminish on a long-term basis causing poor healing of sores, development of ulcers and, in the worst cases, gangrene and amputation. It is important to seek medical assistance immediately if you suffer from Reynaud’s and develop an ulcer or infection on one of any of your fingers or toes. Conventional treatment of Reynaud’s will include treatment of the underlying condition (In Secondary Reynaud’s) as well as medications to reduce the frequency of attacks and prevent tissue damage. These medications work mostly on the principle of dilating the blood vessels in order to prevent the symptoms of Reynaud’s. In severe cases surgery on the nerves in the hands and feet may be performed. There are a lot of things that can be done naturally to get the blood pumping and circulating around the body. Regular moderate exercise (especially gentle exercise upon waking) can help to get the blood pumping around the body. Massage can also help to increase circulation and remove impurities through the circulation of lymph fluid. Natural remedies have been used in traditional medicine for thousands of years to support the circulatory system and the blood. In more recent times, research has confirmed this traditional wisdom. There are now many published clinical studies demonstrating the ability of a range of herbs to help maintain healthy blood flow to cold extremities. Herbs have also been shown to support the cardiovascular system and circulatory system, including healthy circulation and heart health. Circu-Live is a 100% safe and effective natural remedy for improving circulation and treating Reynaud’s Disease. Containing 100% herbal ingredients with well-known positive effects on systemic, cardiac and circulatory health, regular use of Circu-Live will help to reduce the troublesome symptoms of Reynaud's Disease and other circulatory disorders naturally - without the side effects of prescription drugs or the risks of surgery. Ginkgo biloba is an extremely effective herb used in Traditional Chinese Medicine and derived from one of the oldest trees on earth. Its medicinal properties have only been discovered by the West during the last 20 years, where clinical studies have indicated its effectiveness in restoring the functioning of the circulatory system and improving peripheral blood flow to the extremities as well as circulation to the brain. Active ingredients of Ginkgo include flavone glycosides, bioflavins, sitosterol, lactones and anthocyanin. Studies indicate that the beneficial effects of Ginkgo on circulation can help to prevent tissue damage and poor circulation associated with Reynaud’s disease. Zinziber officinalis is more commonly known as Ginger and has a long history of medicinal use in traditional Chinese and Ayurvedic (Indian) medicine. Chinese herbalists often recommend this "hot" herb to treat conditions involving difficulties with cold, including the cold fingers caused by Reynaud's. Ginger is excellent for improving poor peripheral circulation in Reynaud's disease and chilblains, and as a warming circulatory stimulant. It also has strong anti-inflammatory and pain relieving properties and is used to treat the pain of arthritis and similar complaints. Ginger is an excellent remedy for digestive disturbances including relief of nausea, vomiting, flatulence and indigestion. Rosmarinus officinale (Rosemary) dilates and strengthens blood vessels and increases peripheral and cerebral circulation. Rosemary is an invigorating herb, relieving depression and imparting a zest for life often helpful in preventing fatigue and stress. As a combination between a nerve stimulant and circulatory tonic, Rosemary is particularly suited to conditions which cause symptoms of cold due to poor circulation. Rosemary is also known to improve mental functioning and memory, strengthen digestion and improve liver and gallbladder function. 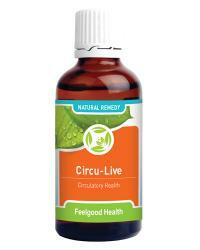 Circu-Live comes in a convenient tincture form and is available in 50 ml bottles. Simply dilute drops in a little water or juice and drink! Adults: 12 - 15 drops in 1/4 cup water or juice three times daily. Children under 12: One drop per age year of the child diluted in a little water or juice three times daily. Caution: Please consult your medical practitioner should symptoms persist. Safety during pregnancy and nursing not yet established. Do not use concurrently with Warfarin or other blood thinning medication unless under medical supervision. Full effectiveness in improving circulation and treating Reynaud’s disease will be apparent within 3-6 weeks of using the remedy though some people will notice results even sooner. One 50 ml bottle will last approximately 30 days. A 90-day supply (see the Buy 3 Get 1 FREE special) would be three bottles. Reynaud’s is very common and affects between 5 and 10 percent of the population. The overwhelming majority of people with Reynaud’s have the primary form of the condition and most sufferers are female. How do I know whether I have Primary or Secondary Reynaud’s? Primary Reynaud’s is by far the more common form of this condition though it is important to seek any signs of any underlying disease that may be treatable. You will need to consult your health care practitioner who will examine you for signs of an underlying condition that may be causing Reynaud’s and may also conduct blood tests. I get migraine headaches. Could they be related to Reynaud’s? Migraine headaches have been associated with Reynaud’s in some scientific studies as they may also be caused by problems with the circulation and blood vessels. Migraines may also occur as a side-effect of prescription drugs taken for Reynaud’s. We recommend Feelgood Health 'Migone Plus' for effective migraine prevention and as an excellent companion remedy for Circu-Live. Will my Reynaud’s get worse over time? Reynaud’s does not necessarily deteriorate with time or age. In fact, in some people the symptoms improve over time even without treatment. In Secondary Reynaud’s however, as the underlying condition worsens the symptoms of Reynaud’s are likely to become more troublesome too. There are a number of things you can do to help manage your condition and decrease the symptoms of Reynaud's. Dress warmly when going outdoors in cold weather. Wear a warm, woolly hat, socks and water-resistant shoes as well as good-quality gloves or mittens. When taking something out of the freezer, wear gloves or oven mitts to protect your hands from the cold. Nicotine in cigarette smoke causes constriction of blood vessels so if you are a non-smoker avoid bars and places where you are exposed to second-hand smoke. Smokers should seriously consider quitting. See our effective and natural remedies to help you quit smoking and reap lifelong benefits of improved health and circulation. Regular exercise will keep your entire body in peak health and will have particular benefits on the circulation as well as on stress levels. As stress can exacerbate the symptoms of Reynaud's, examine your lifestyle to include stress management and prevention strategies. Feelgood Health PureCalm and Triple Complex Nerve Tonic will help to relax you when the going gets tough!